For this week's What I Wore Wednesday (WIWW) I kept to my theme of, yep you guessed it, polka dots! I promise I own non-dotted clothing. Maybe next week I'll prove it. I found this shirt from Target a few weeks ago and I instantly fell in love with it. 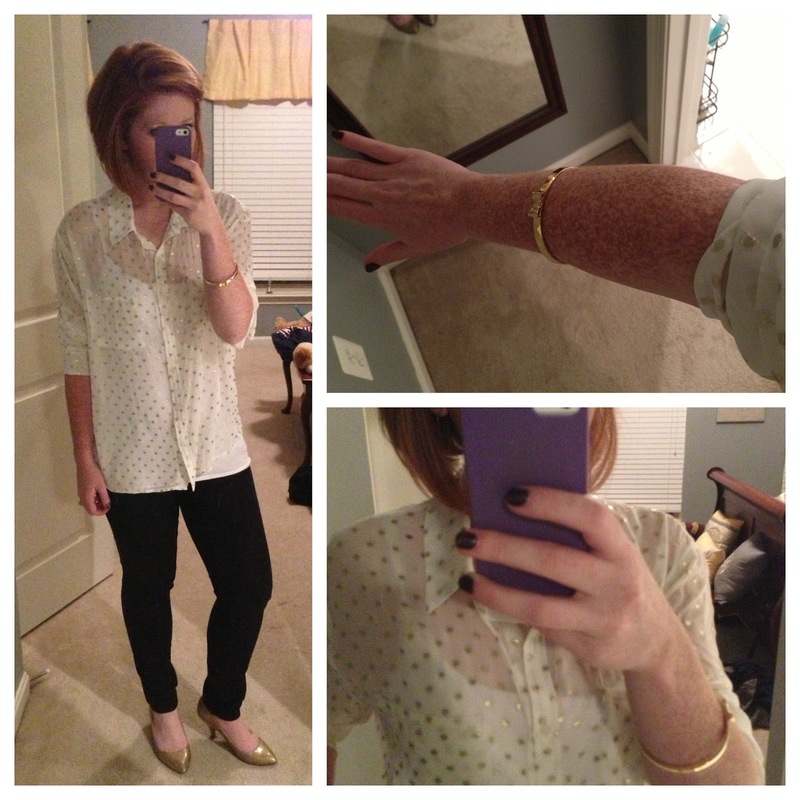 Sheer blousy shirts are very popular right now and this gold glitter polka dot blouse shirt was just my style! (Not to mention comfy) It reminded me of a Kate Spade shirt but for like 10% of the price at a mere $18! Pair this shirt with some skinny jeans (I'm wearing black) and some pumps to dress it up or flats to make it more casual and there you have it. A fun outfit for a night on the town! What are your thoughts on blousy shirts? Do you prefer gold or silver? I'm linking up with Lindsey @ The Pleated Poppy for WIWW! New follower! :) Super cute blog! I love it. I have a very similar one from Forever 21 (like, they look identical) and it's one of my favorite purchases.